Lok Man Rare Books offers a wide range of signed and rare books, first editions, and important folios. Centrally located on Hong Kong's Chancery Lane, the shop provides its clients with the opportunity to discover literary riches from an extensive variety of genres and a host of celebrated authors and illustrators. Lok Man Rare Books is a professional member of the Antiquarian Booksellers Association and the International League of Antiquarian Booksellers. The shop's many treasures include works of modern and classic literature, children's literature, food and wine, history and travel, economics and finance, and sport and hobbies. The business has been featured in local and international publications including Tatler, Prestige, The Peak, Financial times, Luxe Guides, Asia Pacific Boating, HK Business, Gafencu, Louis Vuitton, Elle Decor and Concierge; see here. 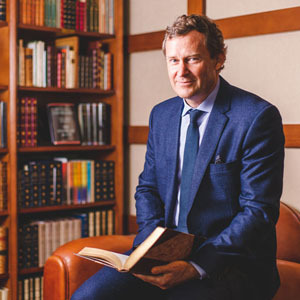 Proprietor Lorence Johnston, whose own varied interests are reflected in Lok Man Rare Book’s breadth, provides expert and personal guidance to his customers, whether they seek a unique gift or are looking to expand their own collection. Relying on his many contacts around the world, Lorence is also able to source especially rare books for his clients. Lok Man's very own self-proclaimed Edna Mole of The Incredibles, Elena was previously a pianist by trade but now puts her fingers to the task of keeping Lok Man Rare Books well-oiled behind the scenes. She adores stories, particularly detective fiction, with Agatha Christie a firm favourite. It is for this reason that an interest of hers is incidental music and its ability to set a scene. Others include corgis, Christmas and cooking (oh my!) and she can be found grilling the perfect steak when she isn't travelling to Japan to enjoy an onsen with the snow monkeys.